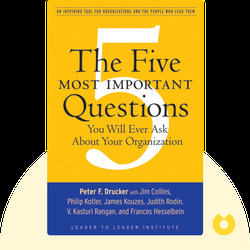 The Five Most Important Questions You Will Ever Ask About Your Organization (2008) presents readers with five simple yet highly effective questions that any manager, owner or stakeholder should ask in order to increase their organization’s chances of success. While these questions are focused on non-profit organizations, the lessons are applicable to any organization seeking to make a difference. Peter F. Drucker (1909-2005) was a pioneer of management theory. He worked as a writer, teacher and consultant specializing in strategy for business and social sector organizations. He has authored over 30 books, including Concept of the Corporation (1946) and Post-Capitalist Society (1993). 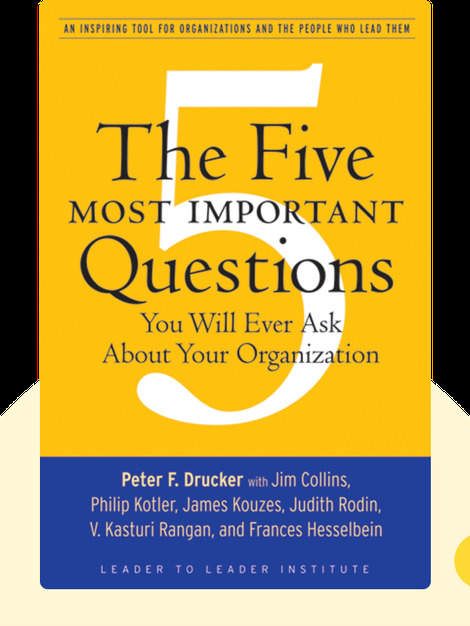 © Peter F. Drucker: The Five Most Important Questions You Will Ever Ask About Your Organization copyright 2008, John Wiley & Sons Inc. Used by permission of John Wiley & Sons Inc. and shall not be made available to any unauthorized third parties.